This is my closing card for this evening. I love to make easel cards, they are just a little difficult to photograph. This card folds down to become a 41/4" X 5 1/2" card. 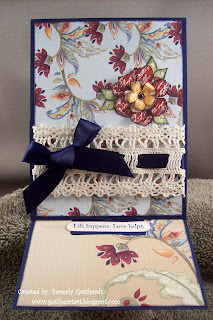 These yummy papers, a wonderful stamp set, some lace and ribbon make a very pretty card. Supplies: Papers: Stampin Up-Night of Navy, Designer Series Paper Paisley Petals, Very Vanilla, Stamp: Vintage Vogue, Ink: Cherry Cobbler, Night of Navy, Old Olive, Peach Parfait, Word Window punch, Modern Label punch, tiny brad, lace and ribbon unknown. Beautiful easel card, fab papers, love your crochet lace trim! Thanks for playing along with us at the Bloggers Challenge! Love this DSP and take on the sketch. You did a fabulous job of it.! Thanks for playing along. A beautiful easel card with wonderful papers and lace. Beautiful card love the papers and the combination of ribbon and lace is fantastic! beautiful papers and the flower is gorgeous. Thanks for playing with us at Blogger's Challenge. There's so much on this card to love! I am especially fond of that lace! Very pretty, I love your flower and your DP is fab! Thanks for playing at the OCC this week! A beautiful and stunning card!! So pretty with the lacey trim. Thanks for playing along with for the BC Challenge. This is so pretty, Beverly! Love that flower and DP and of course, I love the lace too! Wonderful job on the easel card challenge. It's so great to have you as a regular player over at Our Creative Corner! You might see tomorrow's OCC post in your reader tonight. We had a little glitch and it went live this evening. I pulled it back and rescheduled it for tomorrow morning. Your card for that challenge is spot on! So totally beautiful! i love what you did with the sketch.. your colors and textures are gorgeous!